Fractionation is a physical modification process. It is widely used in the oil modificaton plant. There is no chemical change to the products. And of course in the process of dry fractionation, there is no use of costly or hazardous chemical additives, no yield loss and no contamination of the oils. Because it produces no effluent, the dry fractionation process is also environmentally friendly. Dry fractionation, also known as crystallization from the melt, is fractional crystallization in its simplest form. The features of the technology allow it to be used for the production of commodity fats. 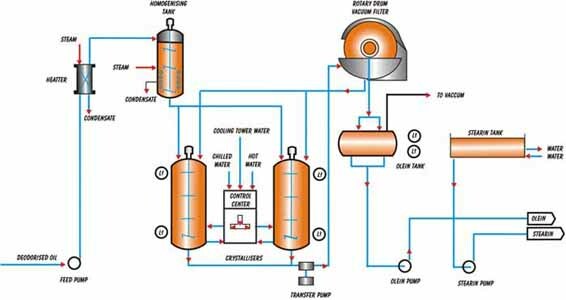 Dry fractionation has long been regarded as an unpredictable, tedious and labor-intensive process. However, the relatively cheap dry fractionation technique has evolved to the modification technology of the 21st century, as without additives, polluting effluents or post-refinement involved, the sustainability and safety of the process is second to none. The production of oils from oilseeds and oil-rich fruits such as the olive and palm almost certainly pre-dates biblical times, but oil modification processes are generally not more than one hundred years old. The widespread use of the three oil modification processes—hydrogenation, interesterification and fractionation—in the twentieth century extended the range of applications of the triglyceride oils almost beyond recognition. These processes principally serve the purpose of modifying the melting properties of oils and fats in order to improve their functional properties in specific applications, but the processes are also used to improve the stability of the oils and fats thus processed. Combines all operations, and monitors from a fully automated centralized control station. Easy to operate, requires minimum supervision.Good flexibility. Wide range of process applications possible. Feedstock can be crude, semi refined or fully refined palm oil. Suitable for both single or double fractionation. - Low consumption of utilities. - Good crystallization repeatability to yield consistent product quality. - Low olein cloud point, with improved low temperature stability; cloud point as low as 2 °C with an iodine value of 65.0 possible.